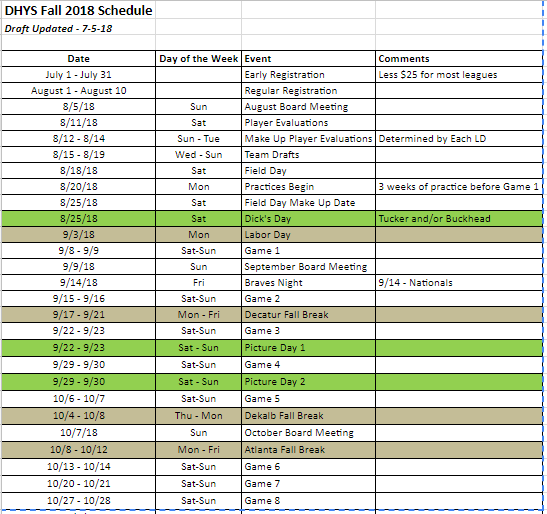 Fall ball usually consists of 2 activities per week: Prior to the first game, both will be practices - one during the week and another on the weekend. Once games begin, activities will consist of 1 practice per week, usually a weekday, and 1 game per week. Fall season will conclude late October/early November. Baseball games will take place on Saturdays and Sundays. For 6U-10U, there will be one 1 week night practice per week. Most games will be on Saturdays. For Middle School teams, there will be 1-2 practices per week. Most games will be on Saturdays. DRAFT SCHEDULE. Use this as a GUIDE to the 2018 Fall Season.